The Mosquito Coast (1986) is one of Harrison Ford’s most fascinating performances and it came at a time when he was able to use his box office clout from the lucrative Star Wars and Indiana Jones franchises to push more challenging films through the Hollywood system. This certainly applies to this film, released 25 years ago today, which focuses on a brilliant inventor who decides that Western society has become too corrupt and materialistic and moves his family to the jungles of Central America where he attempts to manipulate a small village into his idea of a civilized society. Not exactly the most accessible project, but Ford and director Peter Weir, hot off their successful collaboration on Witness (1985), teamed up again on The Mosquito Coast, an adaptation of the novel of the same name by Paul Theroux. The film examines a man obsessed with imposing his will on others to the degree that he exhibits self-destructive tendencies. What better person to realize this than Paul Schrader who was brought on to write the screenplay. He knows a thing or two about these types of protagonists as evident with Taxi Driver (1976) and Raging Bull (1980), both of which he wrote. The Mosquito Coast also allowed Weir to continue his fascination with strangers in a strange land, which he had explored previously in The Year of Living Dangerously (1983) and Witness. So, the trifecta of Ford, Schrader and Weir was an inspired one, but the end result was too extreme for mainstream audiences and the film was a box office flop and received mixed reviews. Charlie Fox (River Phoenix) narrates the film after the events depicted in the film. He is a young, teenage boy who clearly idolized his father: “I grew up with the belief that the world belonged to him and that everything he said was true.” Allie Fox (Harrison Ford) is a brash and brilliant inventor. Right from the first shot, he expresses his disappointment with what America has become as he tells Charlie, “Look around you. How did America get this way?…This place is a toilet.” Weir cuts to a shot of Allie and his son driving down a street dominated by fast food restaurants, their large signs almost completely obscuring several trees and a grassy hill as the visuals only serve to prove Allie’s point and will be eerily relevant towards the end of the film. Allie continues his rant as if he were channeling Travis Bickle’s disgust for society from Taxi Driver: “The whole damn country is turning into a dope-taking, door-locking, ulcerated danger zone of rabid scavengers, criminal millionaires and moral snakes.” Amazingly, these words come out of a film released during the height of the supposedly “Greed is good,” Ronald Reagan-era 1980s in America when the country’s economy was booming. However, these sentiments also apply to our current situation with the war in Iraq, the Enron scandal, 9/11, and the collapse of the global economy. Allie is disgusted by what America has become and is “sick of dealing with people who want things I’ve already rejected.” Ford delivers this angry monologue with just the right amount of self-righteous indignation. The first inkling that Allie is losing touch with reality comes when he agrees to make a cooling system for a nearby farmer. Not only is he late with the device, but it isn’t what the man wanted. Ford is brilliant as he shows how Allie takes a rejection and deflects it, ignoring his mistake as a shortcoming of the farmer. This incident only confirms his beliefs. The farmer’s parting shot is probably the best observation about Allie: “A know-it-all who’s sometimes right.” After observing some poor migrant workers, Allie begins to think about how valuable ice and his cooling system would be in the jungle where it's always oppressively hot. He laments that these workers left the jungle to work basically as slaves for the farmer and muses about the courage it would take to leave civilization and live in the jungle. 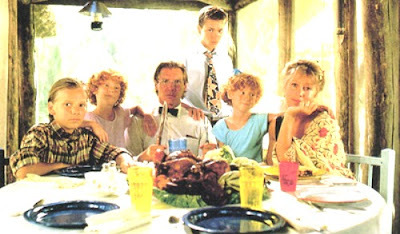 So, Allie uproots his family — wife (Helen Mirren), two sons and two daughters — and heads for the jungles of Belize. En route, he and his family cross paths with the Rev. Gurney Spellgood (Andre Gregory) and his family. Spellgood is a man who will play a prominent role in their lives. Allie has little time for Spellgood and religion, referring to The Bible as “God’s owner’s handbook.” He is even able to quote Scripture back to Spellgood. Like Allie, Spellgood is zealous in his beliefs, they just happen to be based in religion, not science. As soon as Allie and his family arrive, Weir immerses us in this strange new world with an audio-visual assault on our senses with local music and the hustle and bustle of the port city. Allie buys a small town and the next day, he and his family take a boat there. Weir shows a long shot of their journey along a curvy river that goes deep into the jungle and one can’t help but think of Willard’s river journey in Apocalypse Now (1979), only Allie is Colonel Kurtz ready to go native and impose his will on the locals. The river journey features some beautiful cinematography courtesy of Weir’s regular cinematographer John Seale. The vibrant greens of the lush jungle jump out at you and are in sharp contrast to the brown dirt that populates the jungle floor. As he did with Picnic at Hanging Rock (1975) and The Year of Living Dangerously, Weir has a real knack for plunging us in the film’s setting, so much so that it almost becomes like another character. The Mosquito Coast is no different as we see how harsh the environment is, from the intense sun to the monsoon-like rain. This inhospitability is juxtaposed with the beauty of the trees and the serene river that winds through the jungle. Allie puts his family and the natives to work, clearing the land and gathering resources so they can build his utopia. At times, he seems to do so through sheer force of will. Everything seems to be going smoothly until Spellgood shows up and tries to win back the hearts and minds of the townsfolk only to have Allie spurn him yet again, much to the pastor’s chagrin. The confrontation serves as a prelude to future conflict between these two headstrong men. Harrison Ford delivers one of his best performances as he shows us the method to Allie’s madness. He is a charismatic despot of sorts. In a way, many of his diatribes about the wasteful nature of America are right on point. It’s his solution to its ills that don’t always make sense. Ford commits fully to the role without a shred of vanity. He’s not afraid to play an unlikable character and approaches Allie Fox as someone who thinks that they aren’t crazy even though it is pretty obvious that he has a very skewed perspective on things. Ford nails the zeal of Allie’s beliefs but still is able to make him somewhat relatable thanks to his natural charisma. It’s a role that calls for the kind of physicality that Ford excels at as we see Allie building the town with his own hands. He is so good at the physical aspects of acting — hence all the action roles he’s played in his career — and Allie is no different. More importantly, Ford shows how Allie’s megalomaniacal tendencies gradually consume him. It is small things, at first, such as the way he belittles one of his sons for complaining about having to rough it in the jungle. Weir does a good job ratcheting up the tension during a sequence where three armed mercenaries arrive and Allie has to come up with a way to get them to leave. It is where Allie’s madness actually works to his advantage — but at a horrible price — as he'll allow the destruction of everything he worked so hard to build in order to get rid of the mercenaries. Eventually, Allie’s epic vision becomes incredibly myopic as he alienates his own family. The actors that play the family members all excel, from Helen Mirren as the nurturing mother to River Phoenix as the loyal son. Initially, they all believe unconditionally in what Allie is doing, but they gradually come to question his methods. Allie pushes these decent people to their breaking points. After Witness became a big hit, almost every studio wanted to make The Mosquito Coast but Hellman, burned out from shopping the film around and getting rejected repeatedly, wanted to find independent financing. He met with producer Saul Zaentz to ask for advice and to read the script. He did and was so taken with it that he offered to have his company finance, present and supervise the film's distribution. 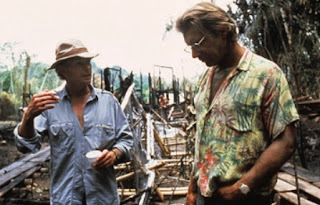 Seeing as how most of the film is set in the jungle, it was crucial that Hellman and Weir find the right location. They considered Costa Rica, Guatemala, Jamaica, Mexico and Hawaii before picking Belize, which had everything they needed —mountains, ocean, jungle and rivers — all within an hour radius of Belize City. It also was an English language country whose political situation was stable. 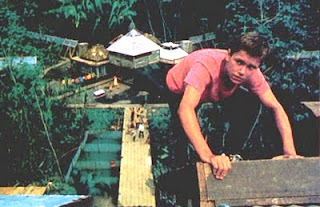 While filming in the jungle, the cast and crew endured cuts and bruises, mosquito bites and heavy sunburn with large snakes common on the set. Ford found the shoot long and humid. It was more exhausting for him mentally than physically because of “the complexity of the role and the endless process of sorting out and reappraising where we were at,” he told the Daily News. Weir drew inspiration for the visual look of The Mosquito Coast from a bulletin board he had on location that was adorned with postcards, pages from magazines, a pressed flower, a match box, and so on. “It’s a question of texture, a kind of mosaic of inspirations,” he said in an interview with American Film magazine. Weir felt that it was important to film the construction of the town Allie owns in continuity, so three versions were created. Each was a little more advanced than the one before. As the crew moved from one set to another, the construction crew would do additional work on the previous set. This allowed Weir to film in days what would’ve taken many months to do. In some respects, one could see The Mosquito Coast as a commentary on the extreme nature of the cult of personality as both Allie and Spellgood are prime examples of people who believe that their vision of society is the right one. At first, Allie’s vision is quite seductive and seems to work but as time goes on and outside forces threaten it, the cracks begin to show. Weir takes an unflinching look at the extremes of science and religion and this apparently turned off audiences and critics alike. It is time for this film to be rediscovered and recognized as one of his more thought-provoking efforts made within the system by a movie star with enough clout to make it happen.